He was a standing example or what he preached, making me feel we could make our children lead better lives if we rendered these lessons to our children and practiced it ourselves to set an example. Setting priorities in our children such as ‘having basic necessities of life like food, clothing, and shelter were more essential than fancy and fashionable articles’ would surely help. The habits built at the cradle carry on to the death bed. This applies in educating our children about the clear demarcation between wants versus needs. Setting up financial priorities in children could start off with teaching them budgeting that is appropriate to their age. Inculcating the habit of budgeting in our children would start off with working together with them and making a child friendly budget. Young children are very happy to have budgets prepared with bright colors, graphs and other visuals. A joint effort would make them feel a part of it and be ready to cooperate and learn. My observation of financially smart adults made me understand that they believed in saving for a goal . So we need to involve our older children by involving them in budgeting for costlier possessions like car, a house, new furniture or probably saving for a sound education or marriage. It is true that even younger children need to be encouraged to save for small fancy needs like probably going for a movie, an evening having pizza or that remote control toy or Barbie doll. Their achievement would give them a sense of fulfillment that could make them feel motivated and focused to save for bigger goals. Motivation has always been the keyword to progress, so praise and rewards could also make a great impact on children learning and implementing financially smart objectives. In addition teaching our children of how to survive and earn would help. So suggesting alternative ways to earn, like helping in the cleaning of the car, helping younger siblings with homework, running errands like shopping for essential or helping in small household chores in an age appropriate manner would surely help. “Putting your savings in the bank would help you earn more money to meet your financial goals,” is what most financially smart parents would have instilled in their children right from childhood. A savings bank account started with parents being a guardian would help overlook their children’s spending habits and guide them. 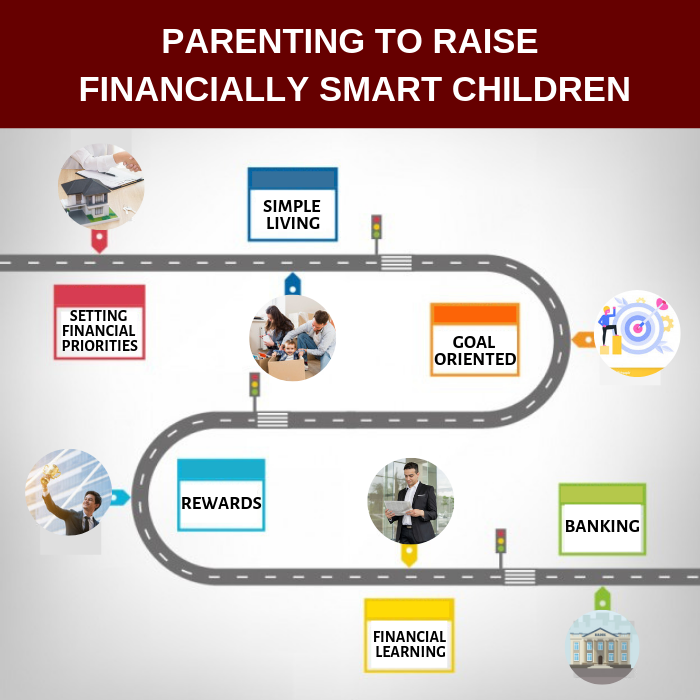 In addition instilling a habit of reading articles and reviews on finance have helped many financially smart children to save for their future once they started earning. Stock , shares and other financially appreciating instruments are best taught to older children, with involving them in real life examples of your investments helping a lot. Next is to introduce them to credit card and loans. When they should be taken and when they should be avoided need to be taught well in advance. Lastly do realize that each child is made in a different way with different spending and savings traits. Identifying each child’s financial habits early in life would help us to guide them tactfully without being imposing on them. I have known of children who have learnt better by their falls in financial decisions, so just rest assured that experience sometimes renders the best lessons for a healthy financial life. Also you can be a role-model to your kids by creating a financial plan for you and your family. They will understand your dedication and discipline in achieving financial goals.